Eight Chinese hostages including two teenagers have been taken hostage by insurgents in Iraq. A video was released yesterday that claimed the eight would be killed within 48 hours if the Chinese Government did not clarify its position on the war. Chinese President Hu Jintao, Premier Wen Jiabao, and other leaders are concerned about security of the eight Chinese hostages in Iraq, and ordered the Foreign Ministry and Chinese Embassy to Iraq to take effective measures torescue the hostages, according to sources from the Foreign Ministry. At present, the Chinese Foreign Ministry and embassy to Iraq are doing the rescue work through all channels, sources said. Insurgents, their faces covered by chequered headdresses, identified themselves as fighters from the Movement of the Islamic Resistance Nuamaan Brigade, apparently named after an ancient Islamic warrior. They released the video and a statement to the pan-Arabic television network al-Jazeera yesterday. "We captured these Chinese as they were trying to leave Iraq. Interrogations showed they worked for one of the Chinese companies helping to build American facilities in Iraq," said one of the gunmen, holding a pistol and an AK-47 assault rifle next to the hostages. Dressed in winter coats, they pointed their weapons at the eight men, who stood silently on a dirt floor in front of a cement wall. "The position of the Chinese Government towards our cause was clear - not taking part in invasion forces and their aggression against our country," said a voice on the tape. 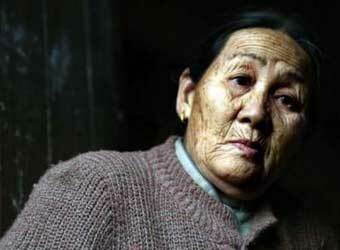 "We call on the Chinese Government to clarify its position on them and other Chinese. We will kill them 48 hours after their pictures are televised unless that is done," the gunman said on the video. Along with the video, al-Jazeera also released a statement, although the network did not release it all at once. Part of the statement indicated that the group could free the hostages on condition they "will quit their work with the occupation forces." The Chinese Embassy in Baghdad confirmed the kidnapping yesterday, while Foreign Ministry spokesman Kong Quan said the government is deeply concerned about the kidnapping and is taking all possible measures to rescue the hostages. Kong said the Chinese people have always been friendly to the Iraqi people and always showed sympathy and support to them. When handling issues concerning Iraq, maintaining the fundamental interests of the Iraqi people has always been the Chinese Government's focus and concern, Kong said. "The Chinese people has always cherished friendly feelings toward the Iraqi people and sympathized and supported them," Kong said. "From beginning to end, the Chinese government has also, in dealing with the Iraq issue, placed emphasis on the protection of the basic interests of the Iraqi people," he said. "The eight are ordinary Chinese individuals who went to Iraq on their own in the hope of finding jobs," Kong stressed. "They rented vehicles to leave Iraq because they had no work to do. "We hope they will be released safely as soon as possible." The Chinese, including two 18-year-olds, went missing last week while travelling from Iraq to Jordan, according to Baghdad sources. Chinese officials said the eight hostages are from the island Pingtan County in East China's Fujian Province. The county, 125 kilometres away from Fuzhou, the capital, is formed by more than 120 islands. According to the Fujian newspaper Dongnan Express, the eight men are Lin Zhong, 38; Lin Qiang, 39; Wei Wu, 38; Lin Bin, 39; Lin Xiong, 34; Chen Zhiai, 36, as well as the two 18-year-olds, Zhou Sunqin and Zhou Sunli. All of them went to the southern city of Najaf in the hope of finding some work at a construction site to rebuild a power plant. The project itself had been agreed upon with Iraq's interim government and has nothing to do with the US-led multinational forces. The kidnapping is the second of Chinese nationals in Iraq. 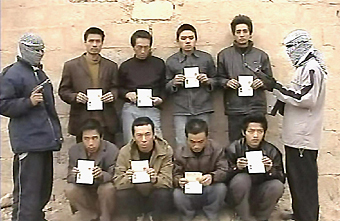 Another seven workers were taken hostage in April 2004 but were all later released without harm. Last May, three Chinese engineers working on a port construction project in Gawadar were killed and nine others wounded in a car bombing. Insurgents have kidnapped about 80 foreign hostages from various countries in a bid to topple the US-backed interim government and drive out American-led troops. Many have been eventually released but dozens have been killed. Followers of Jordanian militant Abu Musab al-Zarqawi, an al-Qaeda ally, have kidnapped and killed several foreign and Arab hostages. Others have been abducted by criminal gangs who either ask for ransom or sell them on to Muslim militant groups with political interests.